Things are progressing right along. We know you want to play Steem Monsters. We're doing all the stuff we can to make a great game experience for you. You should be seeing our first pass at stats and written rules later this month. You should be fighting each other in September! In the meantime while we wait we want to build some additional Steem Monsters themed games. So, we're hosting a Game Jam. A Game Jam is where developers have a short period of time to work alone or in teams. In this case, the goal is to build a Steem Monsters themed game. It could be a rip of Candy Crush. It could be a rip of Poker. It could be a rip of Final Fantasy tactics or even something like a Steem Monsters Tetris. RPGs like Final Fantasy IV or Ultima I are old school awesome too! The idea is to take a week and make a fun game or novellas. Any platform works- game maker, godot, unity, unreal, rpgmaker... whatever. Whatever game looks prettiest, sticks with the monster theme, and is the most fun to play will win a LEGENDARY GOLD FOIL! Second and Third Place will get 200 and 100 sbd respectively. I'm excited to have the support of @elear and the @utopian-io community. Utopian-io is a group on Steem that helps foster, financially support, and grow the open source community. They have pledged to support open source games developed during this game jam. Once open source games have been developed and put out for the community they'll be judged by the Utopian-io community and votes will be placed on posts detailing the games that were created. Opensource developers could find themselves winning $100-200 upvotes for these contributions as part of the development tag or a custom game development tag for this game jam. 👀Posts submitted for review will need the utopian-io, development, and steemmonsters tags. In addition, HTML5 games participating in this Game Jam can have an additional chance of winning extra prizes by uploading their game on Steemgg. Steemgg is the newest HTML5 gaming distribution platform based on STEEM. 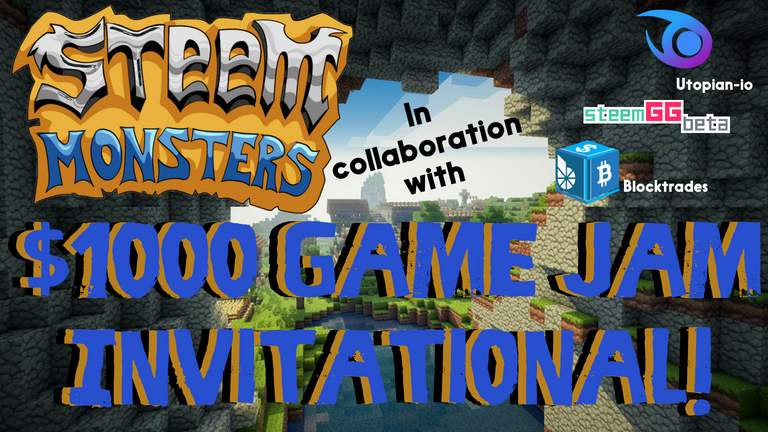 To support the Steem Monster Game Jam, and to encourage more HTML5 game developers using the STEEM blockchain, Steemgg is offering an additional 500 SBD in total prizes for the top participating games that are uploaded onto Steemgg. They've been kind enough to offer vote support to some of the posts and games made during the Jam. It's not completely defined, but we're happy to have their support and eyes on this. To be clear this is good for the Steem Ecosystem. If we can get a ton of games and gamers on the platform then we can start getting a gaming economy on the block! That would be fantastic for the price of Steem if everyone and their guildmates came over to this platform to play their favorite games, earn loot, and trade it for real value in Steem! If you create something awesome, and win, or get some audience love, we're gonna help you make a commercial go of it! Or we'll take it off your hands and send you royalties. 😍 We'll figure out a deal that works. With some hard work and talent, you'll become a business partner with the most successful blockchain game on Steem. That's a good start! "Where can I find out more?" It starts in about 2 weeks. So you have time to get your peeps together! That's where we are hosting the game jam with hopes that crypto centric and non-crypto game devs will see it and join in! A GAME JAM is a short period of time where developers create a game. FIRST PLACE wins a Legendary Gold Foil! UTOPIAN-IO has pledged to support open source games during this Jam. Find out to get those upvotes above! STEEMGG is offering an additional 500 SBD in prizes to HTML5 games uploaded to Steemgg. BLOCKTRADES is also offering upvote support for some posts and games made during the Jam. STEEMMONSTERS has already brought in 200K in only 2 months! Blockchains and games are a great mix. Text dividers created and shared by @calumam. Check him out for lots of graphics!